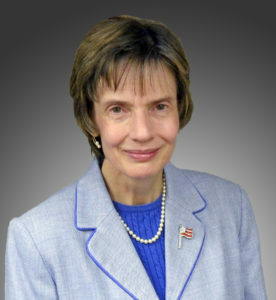 Margaret Myers, a 1968 Boettcher Scholar from Denver South High School, worked her way up the ranks of the U.S. Army, ultimately retiring from the Army Reserve as a colonel. Now the director of the Institute for Defense Analyses Information Technology and Systems Division, Margaret is no stranger to high-profile jobs. She’s also no stranger to being one of only a few women in a male-dominated industry. That’s why Margaret has made it a point to look out for other women—and men—in her career. “When one wins, we all win,” Margaret said. But when she followed her husband to Fort Bragg and joined the military in the seventies, there were very few women to look out for her. Despite this, Margaret served on active duty in the military, was a director in the Office of the Assistant Secretary of Defense for Command, Control, Communications and Intelligence (C3I) and acted as Deputy Assistant Secretary of Defense for C3I Acquisition. 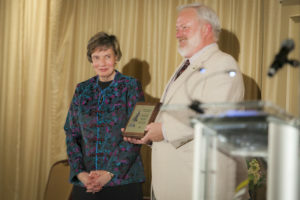 Margaret is the recipient of three Presidential Rank Awards, as well as the Defense Department Distinguished Civilian Service Award and is a Volgenau School of Engineering Distinguished Alumni from George Mason University. Although she has made many career moves and received numerous accolades since, Margaret is grateful for having received the Boettcher Scholarship, which allowed her to attend Colorado College. “I decided early on in my senior year of high school that I wanted to go to CC, but it was too expensive. I didn’t even apply until after I found out I had received a Boettcher Scholarship,” she recalled. Margaret credits CC with exposing her to a liberal arts education, even though she was a math major, and giving her critical thinking skills that she has continued to use ever since. Her college education as well as the early years in her career taught Margaret to take risks—something she now encourages others to do, especially women. This advice has proved effective in her own life and career. When she was a new second lieutenant, Margaret really wanted to do a different job than the one she had been assigned. So, she asked the colonel. He was impressed with her courage, and ultimately, Margaret got to do the job she wanted, which has led her to each subsequent job. In her current role, Margaret focuses on cybersecurity and other cyberspace challenges of national and global significance. When she’s not working, Margaret likes to travel to Colorado to ski.